The Balloon Tree is an award winning farm shop and café at Gate Helmsley, near Stamford Bridge in North Yorkshire. 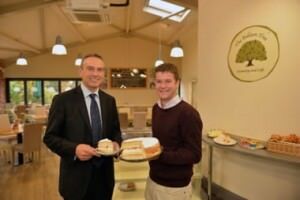 Matthew Machin – Managing Director at The Balloon Tree had prepared a business plan which included updating and improving the farmshop and café facilities. Matthew had witnessed first-hand the growth in farmers’ markets and farm shops over the last 20 years. This has created a new consumer market who prefer to buy local, fresh and often organic products which are sourced locally. Matthew, who has been the managing director at The Balloon Tree for over 10 years, requested advice on financing options from Hunter Gee Holroyd to help him to take advantage of this growth. He asked Hunter Gee Holroyd to assist him to secure a corporate finance deal with his bank to enable him to extend his award winning café facility at The Balloon Tree. Matthew had a vision for the farmshop and had prepared a rough draft of figures. Mark Grewer, Hunter Gee Holroyd’s Head of Corporate Finance, and the Hunter Gee Holroyd Accountantcy team produced a comprehensive cash flow forecast and business plan for Matthew to present to his bank and 2 other banks. Mark also dealt with any financial queries raised by the banks during the application process. The banks commented that the business plan submitted was “the best business plan they had ever seen”. Following the submission of the cash flows and business plans to the banks, Matthew was subsequently informed that his funding application had been successful and was offered the full loan amount from all 3 banks. Matthew accepted the loan with his preferred bank and the expansion plans were able to start. The successful funding of the project has resulted in an impressive facility being renovated and extended at the farm shop. (see photos below – Mark Grewer and Matthew Machin). The spacious and light filled cafe extension opened on 1st May 2014. The café, which serves home cooked breakfasts, lunches and afternoon teas has more than doubled in size with seating now available for 72 customers. A new kitchen, easier access to the children’s play area and a landscaped garden have all helped to improve The Balloon Tree experience for customers and members of the team, which has resulted in increased turnover and profits. The café can now be enjoyed by more customers and is more accessible for those using wheelchairs and pushchairs. Matthew said that they were seeking reassurance before applying for the loan, as they were keen to make the best possible impression with the banks. With the support of Hunter Gee Holroyd, Matthew felt that he had the confidence to deliver a professional business plan so that it was taken seriously. The professionalism of this business plan, as perceived by all of the banks, is reflected in the fact that all three banks approved the loan. The advice and proposals provided by Hunter Gee Holroyd have enabled The Balloon Tree to turn their vision into an impressive reality. The extended café with its bi-fold doors opening onto the landscaped garden has changed the whole feel of the café and farmshop. The café is now a more visually appealing and spacious area for more customers to enjoy the home grown and made produce. 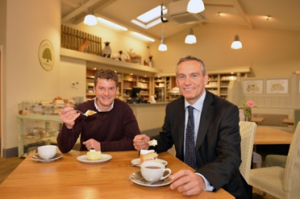 15 jobs have been created in the café and farmshop since it has been extended. The increase in seating available has resulted in higher numbers of customers visiting the café which in turn has impacted positively on turnover and profits in the farm shop. Following a successful year in 2014, The Balloon Tree have been able to expand the shop without having to borrow any more capital, which eases the financial pressures of running the business. Additional revenue streams are also now available including the renting out of a meeting space which can seat up to 18 people. Matthew felt very appreciative for the support and advice provided by Mark Grewer and the team at Hunter Gee Holroyd. He has been particularly pleased to see how accurate the forecast cash flow and profit and loss figures have been compared to the actual reality. Matthew has thanked Mark, Jess and Peter for their assistance, he particularly values the excellent relationship they have built up over the years. Hunter Gee Holroyd were delighted to be able to help Matthew, who has created an award winning venue which is proving to be very popular with customers. Hunter Gee Holroyd used their expertise and understanding of what is required to successfully secure funding which has helped The Balloon Tree to build an impressive café facility to make a difference to both customers and staff. The improved space is really helping to move the business forward, with its increased turnover, profits and most importantly of all – happy and well-fed customers!